One of the strengths of a Drobo is that you can use up to four SATA hard drives, regardless of brand, speed, cache size, or capacity size. I’ve been wondering about the cache size from 16 to 32 MB because that could be a $10-15 difference. Going from 8 to 16 MB cache has a big improvement; from 16 to 32 MB has marginal improvement on the order of a few %. Of course, once you get to 1 TB hard drives, most of them have a 32 MB cache anyway. I wrote a few days ago to brag that I finally have a Drobo. I just wanted to share my experience with it these past seven days. Followed the instructions right out of the box and everything was a breeze. I realized that I didn’t have a Firewire 800 port, but rather Firewire 400. So, until I get a cable converter, I’m using USB 2.0. My two 500 GB hard drives went in, I powered it on, and the Drobo drivers installed onto my Windows machine. Next, I installed the Drobo Dashboard software to get the hard drives formatted. It stated five minutes to format, but it only took one or two minutes. Once that finished, I updated Drobo Dashboard and Drobo firmware. That’s it. Within maybe 10-15 minutes, I had 460 GB of protected hard drive space. I copied all my photos and Lightroom catalogs from my main hard drive to the Drobo. As of now, it’s using 192 GB. I’m not sure if I’ll move more onto it because everything else important is already being backed up to my Amazon S3 bucket with Jungle Disk. Maybe I’ll setup a Replicator job to sync into a folder on my Drobo. I’ve been currently working with those Lightroom catalogs off the Drobo. I might switch that to my main hard drive for a speed boost, but it’s not bad. I’ll bet it’ll be better if I was taking advantage of Firewire. Soon enough. I can barely hear the Drobo fan. It’s on top of my desk, maybe 2-3 feet away from me. With the TV on, music playing, or a house fan on, I don’t notice it. I briefly [owned] a Drobo and had it connected to my PowerMac G5 tower. Up until the first official firmware update, I was a happy camper. All the cartoon physics you described were in effect. However, after the update, my Drobo would not remount, so I rebooted. This was the first time I’d seen this behavior so [I] was surprised. I called Drobo tech support, sent in a diagnostic file from the Drobo, then waited. [I’d left it off the entire time for fear of wrecking something.] After a few days, I was given explicit restart instructions, […] generated another diagnostic file, then waited. A week went by, then two. […] After several more calls, checking on the techs and providing two more diagnostic files – by this time, it was nearing 4 weeks – I was told that my data was gone. I asked if they could [examine] my drives […] and was told there was nothing to recover. 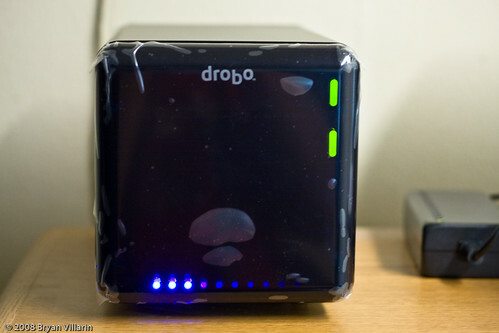 I’ll email Drobo tech support because this is serious. Example – Let’s say I had about 1 TB of data on my Drobo. If a new firmware version was released, before upgrading to that, would I need to back that data off onto another external hard drive…just in case? That defeats the simplicity. Unless something is broken or a firmware update greatly increases reliability and performance, I probably won’t touch it. I don’t want to worry about losing data WHEN one of my hard drives dies. WHEN I need more space, I love how easy (and inexpensive!) it’ll be to buy/install more internal hard drives. I won’t have lots of clutter associated with various external hard drives along with their accompanying cables and power cords. This device isn’t for everybody. Once you understand what it can and can’t do, I think you’ll buy it with excitement. For more information, visit the Drobo website. Disclosure: I bought the Drobo with my own money. I didn’t get any money out of writing this review. But, if you do end up purchasing it through Amazon, can you use my referral link below? Amazon will give me a really tiny cut. Thanks! Firstly, Drobo is [f]astest on USB in Windows. We highly recommend not using [Firewire] on a Windows [c]omputer due to Windows driver instability. Second, [f]irmware updates are the first and most safe step in troubleshooting any Drobo issue. The Drobo has been out of Beta for almost a year now. Chris H’s comment was from a Beta Drobo from the records I found. Drobo has a backup firmware in case the update is not installed correctly. The Drives and data are never [a]ffected by firmware updates [anyway]. Also, if you have any doubt at all, you could always standby, power down, eject the drive pack (all the drives in order) then power up and update the firmware. Then standby, power down. insert drive pack, power up. Lastly from the above, I doubt the Beta Drobo died due to the firmware update, It was most likely a multiple drive failure soon after doing the update. 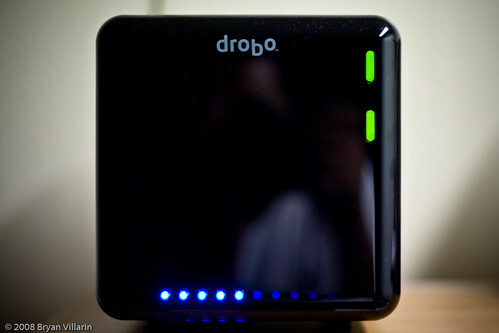 If Drobo dies you can replace and Drobo and put your drives in a new one and have your data. If a drive dies the Drobo handles it automatically and asks you to replace it. I’m pleased that they addressed my concern about using USB rather than Firewire. I guess getting that cable is overkill. But, should I/we be happy with that reply altogether? I hope so.